Victory in the Total 24 Hours of Spa for Team Phoenix trio Frank Stippler, Rene Rast and Andrea Piccini has seen Audi become the first manufacturer to field winning cars in the Le Mans, Nurburgring and Spa 24 Hour races during a single year. 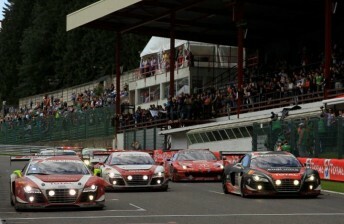 The Spa classic came down to a two-way Audi fight between the #16 Audi Sport Team Phoenix and #1 WRT entries in the final hours, with the latter Stephane Ortelli/Christopher Haase/Christopher Mies crewed car only falling from the lead lap with a strategic mistake deep into the 23rd hour. A late decision to pit Ortelli under Safety Car saw the #1 car held at the end of pitlane by race officials, before being handed a drive-through penalty for an unsafe entry. The victorious Audi eventually greeted the chequered flag having completed 509 laps in a race punctuated by heavy showers and Safety Car periods. Audi had looked set to score a sweep of the top three places before Edward Sandstrom crashed the #2 WRT car he shared with Laurens Vanthoor and Marco Bananomi out of third place with little over three hours remaining. The #66 Vita4One BMW Z4 of Frank Kechele, Mathias Lauda and Greg Franchi benefited from the incident, joining the #1 WRT Audi in finishing just one lap down on the winner in third. The pole-sitting car lost time in the third hour by pitting just prior to the first deluge, but ran largely trouble-free for the duration. The Maxime Martin/Bas Leinders/Markus Palttala #3 MarcVDS BMW completed 507 laps to take fourth. The car led for much of the opening hours, but was delayed by a collision with a Ferrari during the night, and was forced to serve a drive-through when Palttala finally got into the car in the 13th hour – a penalty stemming from the Finn failing to respect track limits in Thursday practice. Andrea Bertolini, Alessandro Pierguidi, Louis Machiels and Niek Hommerson took out the Pro-AM class with fifth outright in their #52 AF Corse Ferrari, while the #6 Audi Sport Team Phoenix car of Tom Kristensen, Andre Lotterer and Marcel Fassler completed the top six. The #6 team had arguably been the stars of the race, finishing just eight laps down on the leaders after dropping 12 laps fixing suspension damage at the end of the first hour. Lotterer had shown his nose around the outside of the #62 Lapidus Racing McLaren at the final corner when the latter darted for the pitlane, effectively taking off the left-front corner of the Audi. Martin, Leinders and Palttala now lead Ortelli, Haase and Mies by a reduced 15 point margin after four of six rounds in the 2012 Blancpain Endurance Series. The category will revert to its regular three-hour race format when the season continues at the Nurburgring on the September 22-23 weekend.